The various peptides derived from the processing of TAA are not equally presented by antigen presenting cells. Two classes of peptides can be defined: a) the dominant peptides that exhibit a high affinity for the HLA-I and are frequently expressed at the surface of tumor cells and b) the cryptic peptides that exhibit a low affinity for the HLA-I and are rarely expressed at the surface of tumor cells. We and others have previously demonstrated that tolerance to self-antigens such as TAA, concerns dominant rather than cryptic peptides. Dominant TAA-derived peptides, although potentially immunogenic because of their high HLA-I affinity, are not highly immunogenic because the specific T cells repertoire has been rendered tolerant. This explains why all cancer vaccines tested in clinical studies to date failed to show clinical benefit. All of these vaccines targeted TAA derived dominant peptides. In contrast to dominant peptides, cryptic peptides escape, completely or partially, self-tolerance. This means that cryptic peptides from self-antigens are considered by the immune system as non-self. This also means that the T cell repertoire specific for the TAA-derived cryptic peptides is fully available to be mobilized by cryptic peptide targeting vaccines. Although TAA-derived cryptic peptides can be considered by the immune system as non-self, their use as cancer vaccines must overcome their non immunogenicity. Cryptic peptides are non immunogenic because they exhibit a low HLA-I affinity. Enhancement of their immunogenicity is a prerequisite for cryptic peptides to be used as cancer vaccines and such enhancement can be achieved by the increase of their HLA-I affinity. We have developed a technology that allows to increase HLA-I affinity of almost all cryptic peptides presented by the most common HLA-I molecules (HLA-A*0201, HLA-A*2402 and HLA-B*0702) and produce highly immunogenic « optimized cryptic peptides ». Optimized cryptic peptides from TAA had the two main properties of the neo-antigens: they escape self-immune tolerance and are immunogenic. They can therefore be considered as neo-antigen like peptides. 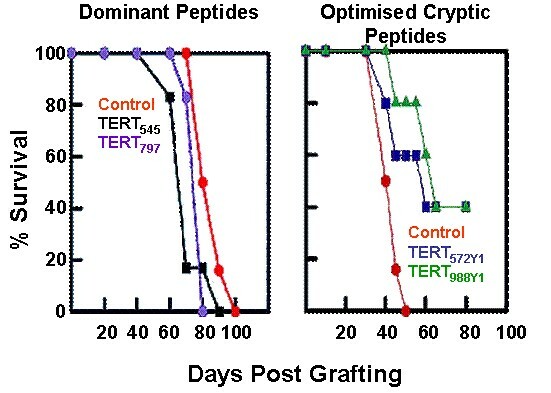 Their use is not limited by the genetic heterogeneity of tumors, especially if the TAA targeted by an optimized peptide based vaccine is a universal antigen such as TERT. All tumor cells express these universal antigens and the probability of antigen loss is relatively low. They are not patient-specific and they do not need to be identified in each patient individually. Optimized cryptic peptides look more like classical anticancer drugs, which can undergo a classical clinical development leading to a broad-spectrum patient treatment.